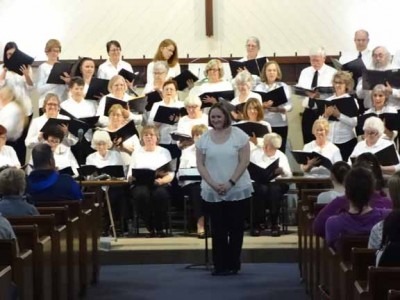 Lockport Chorale Spring Vocal Concert: "From Screen To Stage"
The Lockport Chorale, an adult singing group formed in 1982, will present its spring concert, "From Screen to Stage," at the Lockport High School on Friday, June 1, 2018 at 7:00 pm. Songs from the Broadway stage as well as popular movies and television shows will entertain all ages. Songs from Shrek, Ragtime, The King and I, Man of La Mancha, The Wizard of Oz, The Pajama Game, Route 66, The Mickey Mouse Club, Cinderella, Winnie The Pooh,, The Lion King, Toy Story, 20,000 Leagues Unser the Sea, The Little Mermaid, The Bugs Buny Show and more are included. Director Kristin Hill will conduct and Deborah Hutter is the accompanist. The Chorale has 40+ SATB singers from Lockport and all over Western New York. Also performing at the concert is the North Park Junior High School Select Chorus. Tickets for the concert are available from Chorale members and at the door. $10 general admission/$7 for seniors and students. Doors open at 6:00pm for a basket raffle benefiting the Chorale. Winners will be announced during the concert. The concert begins at 7:00pm. For more information about the Lockport Chorale visit www.lockportchorale.com or contact Pam Graham at 716-778-9817.